Expanding Social Security Is The Official Position Of The Democratic Party! Will Republicans Continue To Support Cuts? The Democratic Party has just completed drafting its 2016 Platform. Like all good platforms, this one provides a strong place to stand. One of its primary focuses is economic security. Social Security is a part of that security. Just as politicians stand on their Party platforms, workers and their families stand on Social Security's platform of security in the form of life insurance, disability insurance, and retirement annuities. The 2016 Democratic Platform proclaims clearly and forcefully,"We will fight every effort to cut, privatize, or weaken Social Security... Democrats will expand Social Security... and we will make sure Social Security's guaranteed benefits continue for generations by asking those at the top to pay more." This call to expand, not cut, Social Security is extremely wise policy. Expanding Social Security is a solution. It is a solution to the nation's looming retirement income crisis where most workers will be unable to cease work without a drastic reduction in their standards of living. 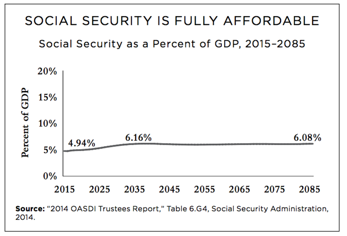 In light of Social Security's near universality, efficiency, fairness in its benefit distribution, portability from job to job, and security, the obvious solution to the nation's looming retirement income crisis is to increase Social Security's modest benefits. Moreover, expanding Social Security, while requiring the wealthiest to pay more -- indeed, their fair share -- is a solution to the nation's perilous and rising income and wealth inequality. Expanding Social Security is a solution to the financial squeeze on working families. Expanding, not cutting, Social Security represents the will of the people. As polarized as Americans are over many issues, Social Security is not one of them. Poll after poll shows that Americans are overwhelmingly united in their strong support for Social Security. They believe Social Security is more important than ever. They adamantly object to it being cut, and favor its expansion. These views are shared by Republicans, Independents, and Democrats. They are held by self-identified Tea Partiers and union households. All ages, genders, income levels, races, and ethnicities hold these views. Strikingly, a recent Pew poll discovered, toward the end of the Republican presidential primary race, that notwithstanding Senator Ted Cruz's and Governor John Kasich's support for deep cuts to Social Security, 66 percent of Cruz's supporters and 62 percent of Kasich's supporters opposed cutting Social Security. And, the survey found that 73 percent of Donald Trump's supporters opposed cuts to the program. Recognizing the wisdom of expanding Social Security and its popularity, the Democratic Party has enshrined the position in its 2016 Platform. Now it is the Republicans' turn. The Republican leadership has long favored cutting Social Security or even dismantling it. During the Republican primary, Donald Trump opposed expansion, but did loudly state his opposition to cuts. But will he stick with that position and will his Party's Platform reflect it? Since Trump became the presumptive nominee, he's been backing away from his pledge not to cut Social Security. Sam Clovis, Trump's chief policy advisor (and a longtime supporter of privatizing Social Security) said in May that "a Trump administration would be open to reductions in Medicare and Social Security spending." Revealingly, this statement was made immediately before Trump was to meet with Speaker Paul Ryan, a longtime advocate of cutting or privatizing Social Security. Moreover, in a recent AARP Bulletin, Trump used "dog whistle" language that is very typical of Republican rhetoric on Social Security: "As our demography changes, a prudent administration would begin to examine what changes might be necessary for future generations." This is code for Social Security must be cut! Furthermore, Trump's own past statements make his pledge of no cuts extremely suspect. In 2000, Trump wrote The America We Deserve, in which he referred to Social Security as a criminal Ponzi scheme, proposed increasing the retirement age to 70, and claimed, "Privatization would be good for all of us." In a 2011 Fox interview with Sean Hannity, Trump said that he agreed that Social Security, Medicare, and Medicaid should be cut, but "You can't have the Republicans get too far ahead of this issue." He said that Republicans should be very careful "not to fall into the Democratic trap" by cutting these programs without bipartisan cover, or, he warned, if they did, Republicans "are going to lose elections." That cynical reasoning could explain his apparent last-minute conversion to no cuts. This demography-is-destiny claim is an old and tired smoke screen to claim, simplistically, that Social Security is unaffordable. But this claim of unaffordability is ridiculous. As the wealthiest nation in the world at the wealthiest moment of our history, there is no question that we can afford a greatly expanded Social Security. 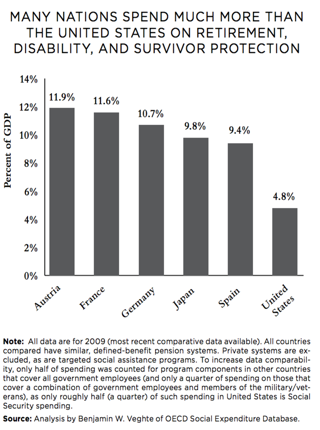 As the following chart shows, Social Security spends around half what many other industrialized countries spend, as a percentage of GDP, on their counterpart programs. Indeed, it is projected that, at the dawn of the 22nd century, Social Security will cost the nation only about six percent of GDP, considerably less than most other industrialized countries are spending on their counterpart Social Security programs today. The late Senator Daniel Patrick Moynihan famously asserted that we are all entitled to our own opinions, but not our own set of facts. The question of whether to expand or cut Social Security is a matter of values, plain and simple. Indeed, the claim that changing demographics makes Social Security unaffordable is particularly sinister. The United States is currently about 62 percent white, 18 percent Hispanic, 12 percent African-American, and 6 percent Asian-American. By 2065, the country is projected to be 46 percent white, 24 percent Hispanic, 14 percent African-American, and 13 percent Asian-American. Does the Republican Party truly want to cut Social Security's modest benefits, just as the population becomes majority-minority? The American people should not be fooled. This debate is not about affordability or fiscal responsibility. It is about what kind of a nation we want for our children, grandchildren, and those who follow. The Democratic Party has taken a clear stand. Will the Republican Party be so forthright and clear? We will soon find out.